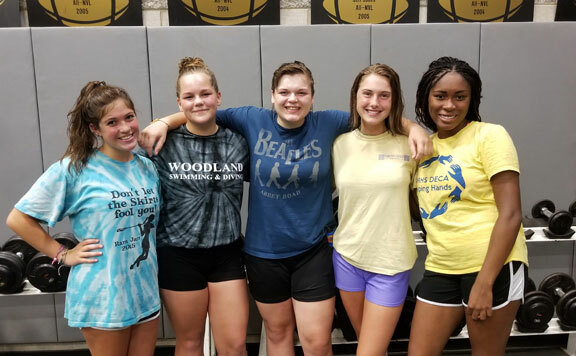 BEACON FALLS — The greatest swimmer in Woodland history and the first Naugatuck Valley League championship in program history might both be in the past, but they both still mean a lot for this year’s Hawks as they prepare for the girls swim season. Nobody was more instrumental in the Hawks’ leadership or success than Gawronski, whose name will likely be plastered on Woodland’s record board for many years to come. Magas said that Gawronski, the All-State swimmer and NVL Top Senior who is now at the Air Force Academy, set an example that he hopes lasts throughout this year and beyond. This year’s leadership will begin with captains Natalie Katrenya, Casey Brooks, Camille Terrell, Aly Rojcov and Morgan Swift. Terrell and Rojcov earned All-State honors with Gawronski and Brooke Pope as part of the Class S champion 200-yard freestyle relay team. “We have great captains again,” Magas said. Terrell (free) and Rojcov (free, butterfly, individual medley) lead a strong and talented group of juniors that also includes Brooks (free) and Swift (IM). Katrenya (breaststroke) is the lone senior captain among a class that includes divers Alyssa VanAlstyne and Adrianna Byczko, both of whom Magas said could be “standouts” this fall. Woodland edged Seymour last year to win the Hawks’ first NVL title. Both teams also finished among the top five in Class S a year ago (the Wildcats finished second, the Hawks fifth), and both figure to be among the top contenders for this year’s league championship. The Hawks will host Waterford on Sept. 12 to open the season before a big early-season meet Sept. 14 at Watertown.